Optimum wellness. Children who exercise regularly have decreased risk of illness and disease. Weight management. Children who exercise regularly are more likely to maintain a healthy weight without restricting food choices, calories and/or fat. Increased energy, mood and physical stamina. Children who exercise regularly feel less stressed, sleep better and get worn out less frequently than those who don't. Exercise is not just about competitive sports. Children should be supervised by an adult and wear protective gear, when necessary, while participating in these activities. If kids have been very sedentary, consult with your doctor about slowly starting them on an exercise routine. Getting kids outside and playing can be a challenge when all they want to do is watch TV and play on the computer. Here are some games to get them moving without any special equipment (you'll probably recognize a few from your own childhood). Have the children bring two shoeboxes with them. Tape the lids onto the boxes, then cut a one-inch-wide and four-inch long slit in each top. Have the children slip their feet into the slits in the boxes and race. Find a number of silly or odd items that can be knocked over by a ball, such as a plastic milk carton, a stuffed animal, a plastic vase of flowers, a pizza box, a tower of empty cans, an umbrella stand, an empty cereal box and a book. Line them up like bowling pins and let the children try to knock them over with volleyballs, tennis balls or golf balls. Have players form a circle. Give one player a rubber ball. That player selects a category, such as 'vegetables'. He/she then bounces the ball to another player in the circle, who must catch the ball, state an item from the category, such as 'carrot', and keep the ball moving to the next player. If the player can’t name an item, holds the ball too long, or repeats an item, he/she is out. Put a strip of cloth in each player’s back pocket. Have the players try to grab each other’s strip without having their own strip taken. The player with the most cloth strips wins the game. Divide the group into two teams. On a clear, flat, lawn, give each team a blanket. Have one player from each team lie down on the blanket. The teams must drag the player on their blanket (magic carpet) from one end of the yard to the other. Whoever crosses the finish line first, wins. The traditional hopscotch board alternates between single and double squares, but you can make up your own fun shapes and paths. This game is best for 2 or 3 players. 1. Draw your path on the sidewalk with chalk and number the squares. 2. Throw a stone to number one. 3. Jump over any squares with stones. Hop on one foot (both on double squares), turning around at the end and hoping back. 4. Stop on the square before your stone and pick it up before hopping back to the beginning. 5. Continue your turn until you miss the square you're throwing towards or you hop on a square with a stone. 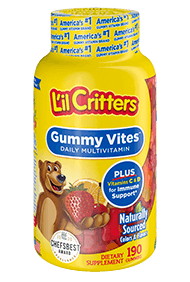 L’il Critters™ - Less sugar than two cherries! Put the yogurt and the milk in the container of a blender. Cover with the lid, but remove the smaller opening in the middle of the blender lid. Add chunks of frozen banana, one at a time, while the blender is running until very thick and creamy. (You may have to stop the machine and scrape down the sides midway to make sure everything is blending evenly.) Pour into one or two glasses and enjoy. Put greek yogurt into a small bowl. Add the brown sugar and vanilla, stirring until the sugar is dissolved. 6. Spread cream cheese over the tortilla to within 1/2 inch of the edges. 7. Arrange all the filling ingredients in a row along the center one-third of the tortilla. Sprinkle with salt and pepper to taste. 8. Roll the tortilla up as tightly as possible to enclose the filling without tearing the tortilla. Cut in half crosswise and eat immediately, or wrap both halves in plastic wrap to pack into a lunch bag. Set the oven on a high heat. Spread tomato sauce over the tortilla then sprinkle the veggies and cheese on top. Place in the oven for about 5 minutes (watch for bubbling cheese - its ready then!). Take out and eat flat or roll it up into a tube to eat. (You can also use a bagel or bread instead of the tortilla for a quick pizza). Slide the pieces of fruit onto a skewer until it is almost full. Roll the kabobs in yogurt to cover the fruit. Spread the coconut over a plate and roll the kabobs in it. Include some healthy staples and some healthy fruits in your breakfast. For instance, pair oatmeal with blueberries, or whole wheat or wheat bran cereal with strawberries or bananas. Try mixing a bran cereal into your nonfat or low fat yogurt. It will perk up your plain yogurt and give it a great crunch. Fresh fruit is also a great addition to yogurt. Try buying plain, nonfat yogurt and mixing in your own raspberries, blueberries and strawberries. You will save money and enjoy a healthy breakfast. Instead of high fat butter, spread your toast with apple butter or soy nut butter instead. Always try to use whole grain varieties of bread like wheat or rye. Eat a piece of whole fruit, like an apple, small banana or an orange. As an alternative, drink a glass of 100% fruit juice. Orange juice, grape juice, apple juice and grapefruit juice are all great choices. Blend 1% milk or milk alternative with fresh pineapple for a healthy, delicious breakfast smoothie. These smoothies are great for people on the go. Make a great tuna salad with grated carrots, green peppers, red peppers, garlic and onion. Make a dish of fresh whole grain pasta and top it with homemade tomato sauce and fresh herbs. Use healthy foods like onions and leeks, along with tomatoes, as a great side dish. Grill healthy fish and serve with a healthy side salad. Try some low fat soups like spinach and broccoli soup. Make a great vegetable stir fry with olive oil. Of course no plan for healthy eating is complete without some great healthy snacks. Below are some of our favorite healthy snacks for those on the go. A piece of fresh fruit, like an apple, orange or banana always makes a great snack. Keep a bowl of fruit on your kitchen counter for easy access. Try mixing nuts and dried fruit for a great homemade trail mix. Hikers and non hikers alike will enjoy this healthy snack. Treat yourself to a great glass of 100% fruit juice orange, tomato or cranberry juice before you leave the house in the morning. Keep a supply of broccoli florets, baby carrots and other bite size vegetables, with some hummus dip, on hand. Make your own fruit salad with oranges, bananas, raspberries, blueberries, strawberries and other favorites. Nowadays for many families, a limited food budget can be a real roadblock to healthy eating. It is an unfortunate fact of life that some of the lowest priced foods, from fast food value menus to cheap potato chips, are also some of the least healthy. It is possible, however, to create excellent tasting, nutritious meals, even on a tight budget. Anyone who has visited a supermarket lately knows how dangerous it is to enter the store without a shopping list in hand. Shopping without a sense of what you need – and don’t need – opens you up to all manner of temptation, and most of those tempting foods are not nutritious. In addition, picking up all those extra items can easily blow your food budget and leave you without the funds to plan those healthy, nutritious meals. A good trick is to keep a note pad near the table or refrigerator. Having the notepad within reach makes it easy to keep track of the foods you need to stock up on. Most major food store chains publish weekly sales ads, usually as inserts in the local newspaper. Keeping track of these sales, and taking advantage of the low prices to stock up, is a great way to gather a cupboard full of healthy food. Once the pantry is full of fruits, vegetables and other healthy fare, it will be much easier to create healthy recipes the entire family will love. Essential staple foods, such as flour, rice, and pasta are frequently put on sale as loss leaders at major groceries. Stocking up on these essentials when prices are low is a great way to stretch any food budget. The old advice to never shop when you are hungry is definitely true. Shopping when you are hungry is a sure way to give into temptation, bust the food budget, and stock up on all the wrong foods. Nutritional labels contain a wealth of information, but it is up to each shopper to read those labels and understand what they mean. Nutritional labels contain complete information on not just calories and fats, but the amounts of various essential vitamins and minerals as well. Just because two cans look alike it does not mean they are. Packaging can be deceptive, so get in the habit of comparing weights when shopping for canned fruits, vegetables and other items. Manufacturers coupons can be a great deal when used on products you already buy. Eating less meat and more beans and lentils is a good way to save money on your food budget while still getting the protein you and your family need. Try experimenting with some vegetarian recipes for interesting ways to use these non-meat alternatives.